I have a mysteriously sick Sycamore tree in my front yard that finally necessitated a visit from an arborist Friday. This guy is a multiple-certified tree guy and even he is stumped. But we are guessing that there was either some kind of chemical burning of the roots (now to figure out how??) or it's the worst case of anthracnose ever! Chris (the arborist) is so confused that he's bringing in the corporate expert to look at my tree on Tuesday. Who knows? It might be the subject of an academic paper someday. Some poor schmoe from UC Davis will be driving down to gather leaf samples and soil samples and scratching his head all the way home. While Chris was here, we walked around the yard looking at general health of everything. Anywhere might lie a clue. With my sycamore dropping leaves like it's November, we are chopping them up and trying to compost them. The spouser put them into our tumbling compost bin, even though I've explained that it's BATCH composter. The mix of carbon and nitrogen must be correct when you begin. You don't continuously add things to a tumbler. Which is why I put all fresh debris into our black standard compost bin and let it cook a while. When that bin is full, I remove that stuff into the tumbler to finish cooking. A semi-cooked batch will finish up in the tumbler in 4-6 weeks. It's a pain of a project to do, but it works. Again, back to Chris. He believes that if the compost get hot enough, it should cook off the powdery mildew and anthracnose spores instead of spreading them around the yard futher. IF it gets hot enough. Which means if it's perfectly balanced with carbon and nitrogen. Better known to us composters and "brown" and "green." 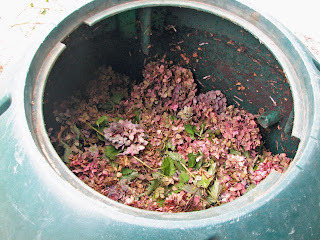 The one problem with composting is that one is either rolling in "brown" or "green" but seldom has the right mix together at one time. At the moment I'm letting our lawn go dormant (we have water restrictions in place) so there is a dearth of green material to add to those leaves in the tumbler. I mixed some Blood Meal in the other day to atleast get some nitrogen in there, but I haven't seen evidence of much cooking happening. 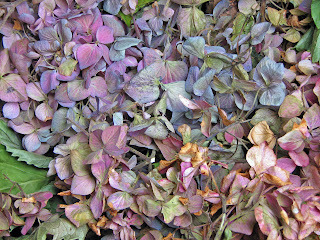 However, Friday afternoon I also trimmed a number of faded blooms off one of my hydrangea plants. And while it's not quite "green" it is live and tender growth and might help to increase the mix in our tumbler. At least until I beg a bag of grass clippings from a neighbor. 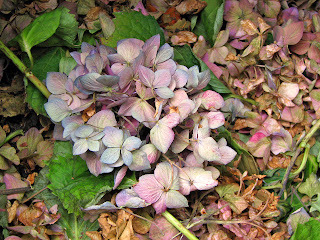 So I stripped the flowerheads from the woodier stems and dropped them on them of the leaves. Then realized these needed to be photographed. Looking closely at them, the texture and color is subtle and beautiful. One would guess that it was taken here inside our tumbler!